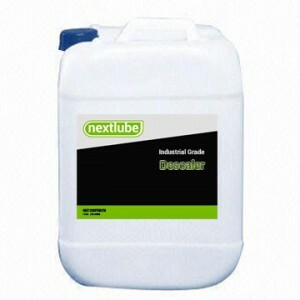 Descaler is a unique combination of surfactants, penetrants and dispersants designed to achieve an effective system for treating scales, corrosion, and deposit. It contains inhibited acid. Descaler effectively penetrates slime deposits, permitting the anti-microbial component to function efficiently. The low foaming action of Descaler facilitates slime penetration. HEAT EXCHANGERS -Dilute Descaler at a concentration of 5 – 15 % by volume. Circulate the cleaning agent at room temperature from 2-4 hours depending upon the thickness of the scales, then drain and rinse with fresh water. Neutralize with NTRA A1DN, then rinse well.